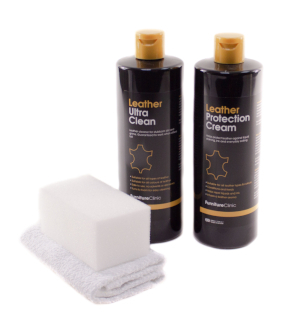 Product description: 500ml Fabric Cleaner & 500ml Fabric Protector come in this special offer cleaning & protection kit. 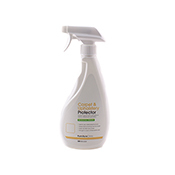 Suitable for cleaning and protecting all fabrics, textile & cloth. 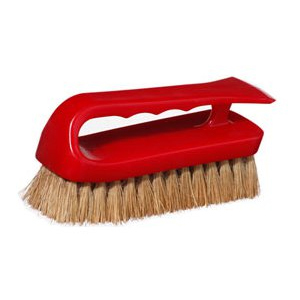 High-quality carpet, fabric and leather cleaning brush. Agitates fibres to release ingrained dirt with ease. 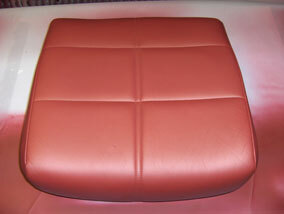 Complete solution for cleaning & protecting fabric. Al in one fabric cleaner and stain remover. 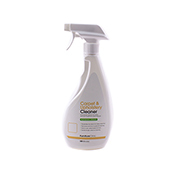 This product is ideal for cleaning fabric materials to maintain them, and also ideal for removing stubborn stains. 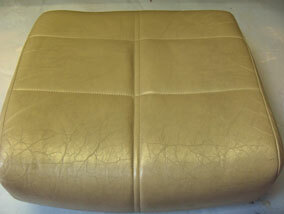 It's made from plant extracts so is non hazardous and safe to use. 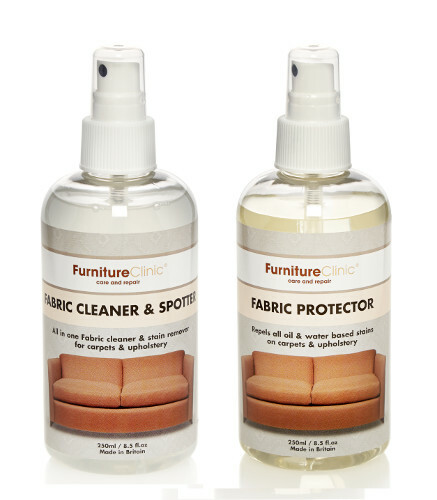 The Fabric Protector repels all oil and water based stains from clothes, carpets & upholstery. Not only that but it makes fabric easier to maintain and clean in the future, as it retains dirt on the surface, instead of it soaking into the fabric. For best results apply the Fabric Protector once a year. The Fabric Care Kit is perfect for use on all fabric items including; furniture and carpets, car interiors, handbags & accessories, footwear and clothing. It contains no solvents or abrasives and so is totally safe to use on all fabrics and textiles, It's even safe to use on delicates such as wool and silk. 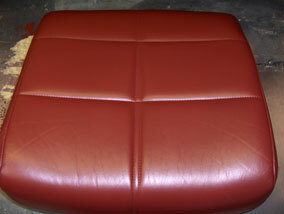 Thoroughly clean and protect a three piece suite! Clean and protect an area of carpet roughly 20m² in size! Both products are specially treated to resist bacterial growth and will safely last 5 years if stored in a cool cupboard with the lid fastened. 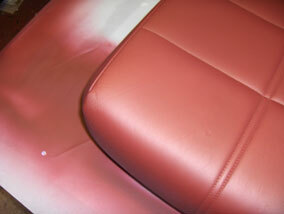 Spray the Fabric Cleaner & Spotter onto the fabric so the area becomes slightly wet. 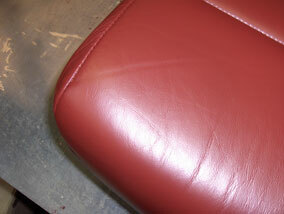 Agitate the fabric using a Tampico Brush and leave it to dwell for 15 minutes, for the product loosens the dirt. 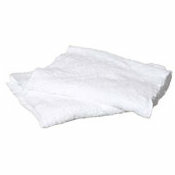 Wipe the surface with a piece of Terry Towel Cloth to remove the dirt. Rinse the cleaned area with warm water and allow to dry. If the fabric is still dirty, keep repeating these steps until it is clean. 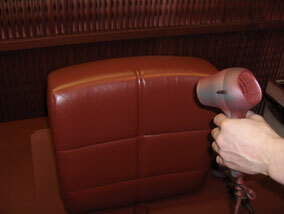 Allow the fabric to dry out and then apply the Fabric Protector to help reduce future staining and dirt. 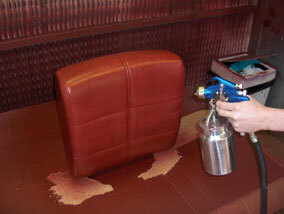 Shake the bottle well and then spray onto the fabric so the surface becomes slightly damp. Fabric Protector causes all of the above stains and more to be held on the surface, preventing them from drying in and staining the fabric. How often should I use the Fabric Care Kit to clean & protect my fabrics? 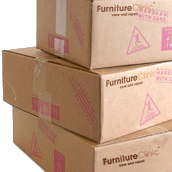 We recommend, for complete, year round protection and maintenance of furniture and other high-use items, that you thoroughly clean your item and apply the Fabric Protector every 3 months. 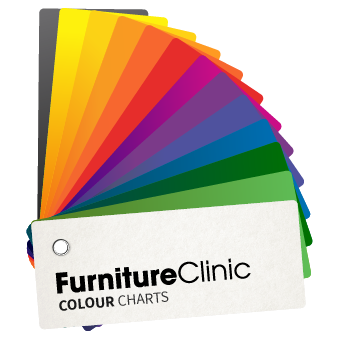 This will ensure your furniture & upholstery, carpets or clothing have total protection from stains, spills and other accidents. I want to clean & protect items made from a very delicate fabric, is the Fabric Care Kit safe to use on them? Yes of course, the products in the Fabric Care Kit do not contain any solvents or abrasives that may damage the fibre structure of delicate fabrics. It is therefore completely safe to use on all fabrics, including delicates such as wool or silks. What kind of staining will the Fabric Protector in the kit prevent? 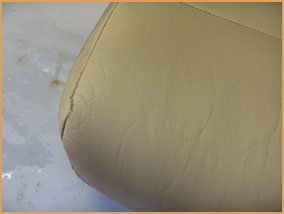 By protecting your fabric on a regular basis you can ensure that when you do drop or spill one of these substances on your fabric items, the dirt/liquid will be held on the surface by the protective barrier and can simply be cleaned off with the cleaner & spotter and an absorbent cloth or sponge. 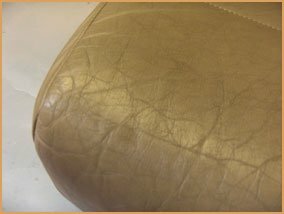 My Fabric Sofa/Chair/Furniture/Carpet is already very dirty, can i still use the Fabric Care Kit? 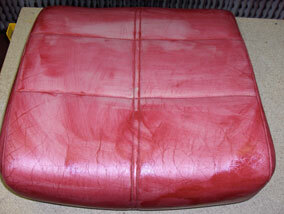 Absolutely, just use the Fabric Cleaner & Spotter in the kit to thoroughly clean the item, removing any dirt or grime. 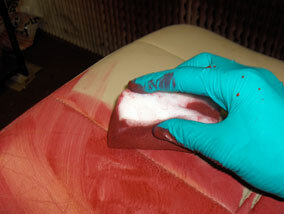 For more stubborn staining that may have occurred before using the kit, we recommend the use of our range of Remove It! 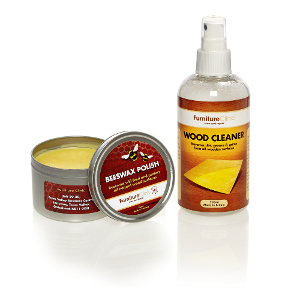 Fabric Stain Removers, this range contains a solution to any stain, no matter how stubborn. Once all staining and dirt has been removed from the fabric you can go ahead and apply the Fabric Protector to guard against any future dirt or staining.